Selling quickly – Get in touch now! Te Ana Marina is breathing life back into Lyttelton’s west side waterfront. Set between two traditional sites, Ōhinehou and Te Ana o Huikai, Te Ana is Canterbury’s only walk-on floating marina. Of the 170 berths, more than 140 have been leased and house various boats from powerboats, to mono-hull yachts, catamarans and launches. As part of stage one of the commercial development, the existing Woolstore adjacent to the waterfront, has also been refurbished and will cater to a mix of commercial and retail tenants, in the near future. A working Port and trade hub for the South Island, Lyttelton is an eclectic mix of industry, creativity and history. The east side has a rich legacy as a place of shelter and food gathering by both European settlers and the original Māori inhabitants, Ngāti Wheke. Te Ana will once again open up Lyttelton’s harbourside and make it a place where people can connect and enjoy the waterfront. Te Ana features Christchurch’s only floating berth marina, complete with walk on access. There are 170 floating berths with lengths of 10m-36m to provide shelter for yachts and powerboats. All berths are supplied with water and power services and supported landside with carparks, lighting, security, a new marina office and washroom facilities. Hospitality and retail opportunities are now available in this exciting new quayside development, with the building’s rustic character featuring a distinctive and appealing offering in this unique shoreline setting. Tenancy options from approximately 80 to 400sq m are available, with plentiful onsite car parking. 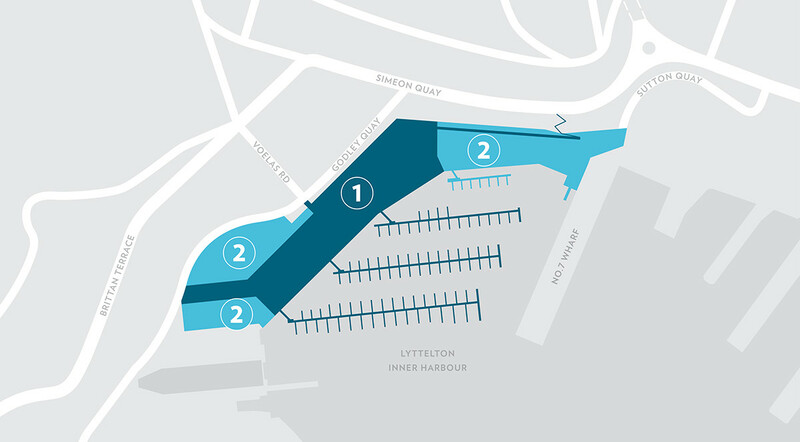 Every ground floor tenant will have expansive views over the marina and will benefit from a captive audience of marina users as well as a pedestrian link connecting Te Ana Marina to Lyttelton. Initial landside rejuvenation features a pedestrian promenade, an improved sea wall and a much tidier environment with a mix of amenities including car parking, lighting and native plantings. Future stages are likely to include marine related retail, professional offices and a selection of restaurants and cafés to round out the area. Our long term vision is to transform Te Ana into a thriving area of Lyttelton for the enjoyment of locals and visitors alike. Te Ana – bringing people back down to the waterfront and ensuring a lasting legacy for Lyttelton and Canterbury. Design Guidelines have been prepared by Lyttelton Port Company in collaboration with Te Hapū o Ngāti Wheke, Christchurch City Council and the Lyttelton community.